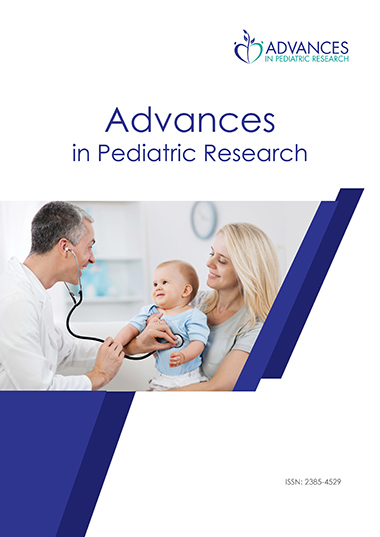 Advances in Pediatric Research publishes original research articles with a potential impact on the fields of neonatology, pediatrics, and adolescent medicine. The editors seek forward-looking, cutting-edge original research, case studies, and systematic reviews. We will also publish invited editorials, expert viewpoints and counterpoints. Advances in Pediatric Research is primarily a clinical research journal, yet translational, genetic and compelling basic science research articles are welcome. The journal’s content is of primary interest to perinatologists, neonatologists, general and specialist pediatricians, pediatric surgeons, and specialists in adolescent medicine. Advances in Pediatric Research may also be of interest to family medicine physicians, nurse practitioners, medical geneticists, and genetic counselors who care for patients under the age of 21. Advances in Pediatric Research publishes articles in perinatology, neonatology, developmental pediatrics, medical genetics, congenital diseases, metabolic disorders that first appear in utero, infancy or childhood, general pediatric and adolescent medicine. Pediatric medical and surgical subspecialties of interest include allergy and immunology, cardiology, dermatology, endocrinology, gastroenterology, hematology/oncology, infectious diseases, nephrology, neurology, pulmonology, and rheumatology. The journal will also publish articles dealing with pediatric public health and social issues such as child abuse, domestic and community violence, education, immunizations, nutrition, and public health policies that directly relate to pediatric patients. Is it possible to save on the treatment of acute pneumonia?